Music Costs > How Much Does an Alphorn Cost? How Much Does an Alphorn Cost? An alphorn is an instrument that many people recognize visually but know very little about. Mention traditional Swiss music and a majority of people visualize alphorn players in the mountainous meadows of the Switzerland Alps. This wind instrument is made of a long tube which widens as it stretches from its wooden mouthpiece to the bell-shaped opening at the end that curves up. Between the bell and mouthpiece, it has no valves, holes, or buttons. An alphorn in great condition could cost anywhere from as little as $1,500 to as much as $6,500, but alphorns made of an exotic wood could cost up to 40 percent more. From our research, a student, starter-like alphorn could cost as little as $1,000, whereas a very well tuned alphorn with a brighter sound could easily cost $4,000+. For example, Alphorn.ca sells a Rocky Mountain Alphorn for $5,250. 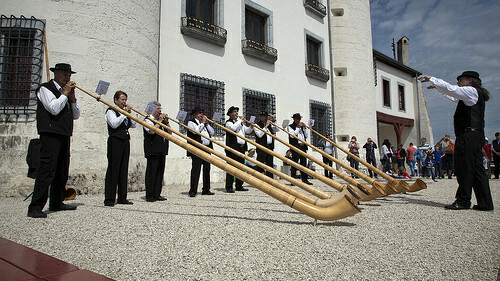 According to KrollTravel.com, a good alphorn can cost $5,000. The alphorn is traditionally twice as long as the individual playing it. More mellow, lingering, and powerful than a bugle, the sound of the alphorn is determined by its pitch. The alphorns have different pitches as the length of the tube dictates the pitch. All notes on an alphorn are made using the lips, and the most common note played using an alphorn is G-flat. The alphorns can also have other pitches, including E, F, and F sharp. An alphorn is either carved or bored in wood and then over-wound with birch bark. Some of the instruments are straight, reaching 12 feet in length. Since the mid-19th century, particularly in Switzerland, its bell may be up-curved. Others, mainly in the eastern Alps, are trumpet-shaped. Also, S-shapes are available. You need to factor in the cost of shipping and handling costs of the alphorn since it can often be hard to find one locally. Depending on the size, the shipping could reach well into the hundreds of dollars, especially if you were to add insurance. Since alphorns are most common in Switzerland, you may have to get one from there, meaning that the shipping costs will be quite high. Carved and customized paint options could add a few hundred dollars, depending on the artist. You could even get the alphorn personalized. Also, consider taking a few alphorn lessons. The average lesson could cost $20 to $40. This is optional, however. A travel case is recommended to protect the instrument on the go. A good case can cost $200 to $400. Additional mouthpieces can cost $40 to $80. Alphorns were made originally from fir trees. Nowadays, these instruments are usually made with spruce or other wood like maple, and at times covered with wicker. Some alphorns are works of art with original paintings and wood carvings on the bell. To make it easier to transport the instruments, they have three to five sections which can be taken apart and then placed in a bag or case, and afterward re-assembled before playing. A good alphorn musician is able to play the melodies without the horn that acts as an amplifier. Around the world, one can listen to alphorn music in orchestra and solo performances. A good quality alphorn is very easy to blow, has excellent intonation, and easy attack. It also should have a tight bore with well-balanced blowing resistance, as well as being light, easy, and agile to blow. The alphorn, otherwise known as alpine horn or alpenhorn, is a labrophone. It is made up of a wooden natural horn of a conical bore, with a wooden cup-shaped mouthpiece and used by the mountain dwellers, alpine herdsmen and villagers in Switzerland. Similar wooden horns were utilized for communication in a majority of mountainous regions of Europe, from the Carpathians to the French Alps. It still is sounded for intercommunication and at the daily ceremonies and seasonal festivals. Consider buying a slightly used instrument on eBay or Craigslist.